OTS 1 and 2 (Orbital Test Satellite) were an experimental communications satellites inherited by ESA in 1975 from its predecessor, the European Space Research Organization (ESRO). 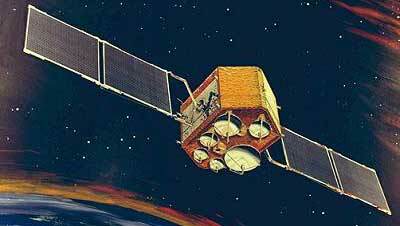 These were the first GEO communications satellites to carry six Ku-band (14/11 GHz) transponders and were capable of handling 7,200 telephone circuits. With a mass of approximately 445 kg on station, the OTS bus was hexagonal with overall dimensions of 2.4 m by 2.1 m. Two solar panels with a span of 9.3 m provided 0.6 kW of electrical power. British Aerospace was the prime contractor from the European MESH consortium which developed the OTS vehicle. The OTS 1 was lost at launch in September 1977. OTS 2 was successfully launched in January 1991. It completed its primary mission in 1984 after which the spacecraft was involved in a 6-year program of experiments, including the testing of a new attitude control technique taking advantage of solar wind forces. OTS 2 was moved out of the geostationary ring and into a graveyard orbit.